There are lots of emotions when we are getting ready to visit Pakistan. There is excitement to meet family, happiness for a vacation and anxiety for packing. One of the most critical aspects of packing is buying gifts to take to Pakistan for friends and family. Folks living outside Pakistan have been the subject of many jokes and memes for the terrible cheap gifts they can bring for family. Jokes aside, budgets can be a constraint for everyone and gifts might not meet expectations. Things have also changed over the years and now almost all brands and products are available in Pakistan. Perfumes: Yes, this is a usual suspect for gifts because it’s something that can suit many tastes. I usually try and shop all year round to be able to make use of great deals. Ointments/Balms: As my loved ones in Pakistan age, I love taking pain-relieving ointments that might help their aches and pains. Comfortable Shoes: Though it’s risky to buy shoes for someone who is not there, if you know the size for family, you can buy specialized shoes built for comfort such as FitFlop and Rockport. Sweaters: This one is a safe bet for men! Buy end-of-the-season for good deals. Chocolates: Who doesn’t love chocolates? While most brands are now available in Pakistan, a little more sweetness never hurts! The best part of a gift is the intention and not the price tag. Make sure you pour your love and attention in the gifts and they will definitely be well-received. Hope you liked these tips. 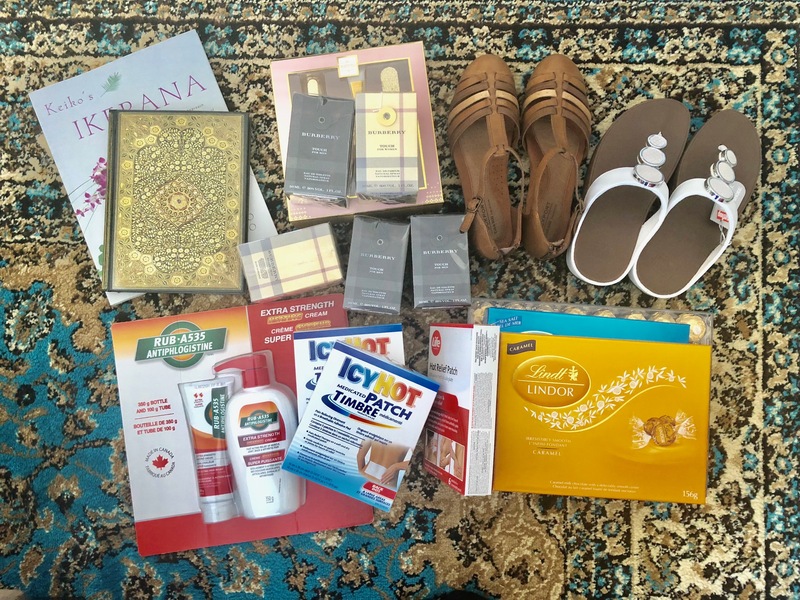 What are some of your ideas for gifts to take to Pakistan? Thanks a lot for this post! I was one of the ppl who requested suggestions for gifts. Ur right its the thought and love that counts and not the price tag. My go to gifts are clothes for kids esp jackets for boys and frocks for girls. For ladies it’s definitely sweaters, handbags abd makeup. I avoid perfumes unless i know someone’s specific choice just coz i feel its a bit of a personal choice. This post saved me as I am planning to visit Pakistan by the end of this year and this will be the first time I am visiting Pakistan. So excited and emotional to meet my ammi. Started looking for tickets and have already started making good use of sales and deals for the gifts. Yes you are right price doesn’t matter, all what matters is love and the intention of caring. I have a question. What should I get for ammi abbu…they are very sober people. Mom likes gardening. Also I want to make my gift presentable. Mostly people just throw things in a plastic bag. I want to do something new presentable and heart warming and convenient too for packing and travelling. Hope to have some tips. Thanks Tamania…I really love your posts.